Husband and wife team Stan Appelbaum, OD, FCOVD, and Barbara Bassin, OTR/L, BCP, are truly one of a kind. The board-certified vision therapist and board-certified pediatric occupational therapist work together in the same practice, offering patients both optometric vision therapy and sensory-integration- oriented occupational therapy. Special Feature: View Photo Gallery of doctors at work. It may seem overwhelming to add optometric vision therapy to an already full schedule, noted Appelbaum, but for many people with learning problems, movement and balance difficulties, eyestrain and fatigue while reading, ADHD and autism spectrum disorder, vision therapy has been the key to significant improvement. 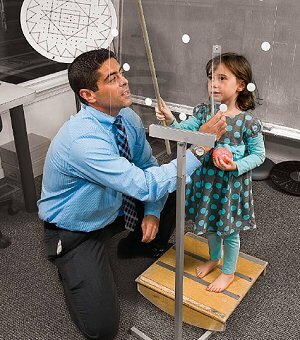 “It’s as if vision therapy seems to ‘open a neurological door’ in the brain so that the plateau reached in other therapies can be overcome, and the child can continue to benefit from these therapies,” Appelbaum said. The bottom line: “We should not be the only ones doing this,” concluded Appelbaum. Vision therapy, to put it frankly, is a kind of occupational or physical therapy for the eyes and brain. Developmental optometrists typically prescribe the non-surgical treatment for common visual problems like double vision, lazy eye, strabismus, attention, balance, dizziness, reading and some learning disabilities. Vision therapy can develop or improve basic visual skills and abilities, as well as the comfort, ease, and efficiency of eyesight, enjoyment of reading and visual thinking (how the brain interprets visual information). Some common ways vision therapy can help patients is by improving visionrelated reading and learning problems, improving vision in “lazy eye,” decreasing cross-eyes or turned eyes, preventing or reducing nearsightedness, enhancing sports performance, alleviating visual stress headaches, and more. Reading and learning problems from convergence insufficiency are probably the most common reasons for patients to begin vision therapy, noted Appelbaum, a certified Fellow of the College of Optometrists in Vision Development. The National Institutes of Health and National Eye Institute have demonstrated that in-office vision therapy prescribed by a doctor is the most effective treatment for convergence insufficiency (CI), one of the leading causes of eyestrain, blurred vision, reluctance to read, double vision (diplopia), and/or headaches. Many times Appelbaum and Bassin recommend starting vision therapy and any other sensory therapies, such as occupational therapy, before or in addition to beginning behavioral therapies and interventions. This will allow pediatric patients to more fully benefit from behavioral therapies and educational instruction. “Through vision therapy, combined with other prescribed therapies, a child’s senses can finally start working together,” said Appelbaum. At Appelbaum Eye Care Associates, PC, in Bethesda and Annapolis, MD, occupational therapy treatments and vision therapy are coordinated and offered in the same office. After the occupational therapist identifies a specific problem, therapy may include sensory integration activities such as vestibular stimulation, massage, firm touch, swinging, proprioceptive activities, deep pressure, sensory diet and bouncing. Occupational therapists use a variety of theories and treatment approaches when providing services. Likewise, many occupational therapists use a combination of approaches when treating children with autism. Treating patients daily with OT and vision therapy, like Appelbaum and Bassin do in their offices, can often result in dramatic improvements in just a few weeks. The co-directors of clinical services at Appelbaum Eye Care Associates, PC, teach visually-enhanced therapy to sell-out crowds allover the country. “There is certainly a huge interest,” Applebaum noted. His clinic is one of only a few in the country offering combined occupational and vision therapy services. To fulfill the demand, Appelbaum has started the very first private practice vision therapy residency through an optometry school that’s fully accredited, with the intention of creating another practice like his own. Share the post "At First Sight"